Get Vendio Gallery - Now FREE! Antique German Bohemian Glass Beer Stein Engraved Musical Symbols c. Description: This beautiful old beer stein was made of blown glass in about mid-1800s - around 1850s. It was hand-blown and engraved with a copper wheel to create a group of musical symbols - a lyre, a trumpet and music score sheet. The nasme Henry Weiss is inscripted above. Very skillfull and labor-intensive engraving job, a work of true artist. 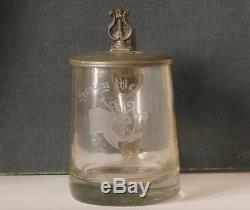 The lid is engraved as well with a lyre and the name Heinrich Weiss. The lid has a large 5 ring closed hinge used before 1860s and a lyre for the tumblift - this type of figural tumblifts were in use in late Biedermeier period of 1840s - 1850s. The stein is in excellent condition. The pontil mark was polished out (a little unevenly). There are some glass impurities due to the manual technology but no chips, lines or breaks. It is 5.5 tall to the top of the thumblift, 0.5L capacity. Use the FREE Counters 1 million sellers do - Vendio! The item "Antique German Bohemian Glass Beer Stein Engraved Musical Symbols c. 1850s" is in sale since Tuesday, March 31, 2015. This item is in the category "Collectibles\Breweriana, Beer\Drinkware, Steins\Lidded Steins\Germany". The seller is "beer-stein" and is located in California. This item can be shipped worldwide.